There are many iOS applications available in the app store that can assist you while you are at home, school, work or on the go. Our Rehabilitation Technology Specialists have compiled a list of free/paid accessible essential iOS applications for your iPhone, iPad and iPod touch that can assist you to improve your independence. What is an iOS app? With built-in accessibility features, accessibility APIs, developer tools, iOS provides an extraordinary opportunity to deliver a superior mobile experience to every customer, including those with special needs. Award-winning features include VoiceOver—the revolutionary screen reader for blind and low vision users, Switch Control, playback of closed captioned or audio described video, Guided Access, Text to Speech, and more. Super fast & safe QR scanner, bar code reader & QR code reader! Scans all QR code & barcodes! Very simple & easy to use! Aim at text. Shoot. It's yours! Prizmo Go lets you quickly grab printed text with the camera. After text is recognized in a blink of an eye, you can interact with it in many useful ways, or just send it to other apps. Boop is an an app to detect levels of light and interpret this information with sound. It allows its blind and visually impaired users to detect whether lights are on or off. It covers a broad range of light levels which spans from sensing daylight through open windows to checking whether the indicator light is on for a wifi router. Is your To-Do list app full of To-Didn’ts? You meant to get them all done but you forgot to check it in time. Maybe, instead of a to-do list, you need RE.minder! Seeing AI is a free app that narrates the world around you. Designed for the blind and low vision community, this ongoing research project harnesses the power of AI to open up the visual world and describe nearby people, text, and objects. Talking Typer is an accessible typing and computer keyboard tutorial app with a keyboard game to help increase speed and accuracy in a fun environment! Learn to type or improve your skills with drills, practice lessons, keyboard explorer, and an entertaining game. It is designed for blind and visually impaired students, but can be used by sighted students too. Travelear promises to take your ears on an adventure like never before! You can finally go to a variety of destinations and environments with a pair of headphones and the click of a button. With Travelear you can hop across the pond and experience the hustle and bustle of London's famous Flower Market or even take a trip down to New Orleans jazz-filled streets. If you're not in the mood for a new city sound then you can always get up close and personal with forest wildlife or simply sit back and relax on your porch as a summer thunderstorm passes by. Let our sounds immerse you into an environmental narrative and make you feel like you are actually there. Stepz is a convenient step counter app that leverages the clever Apple Motion Coprocessor which collects your motion data automatically in the background while saving battery life. This simple pedometer app has been specifically developed for the iPhone and Apple Watch. With SIX fun games, chat functionality, and 100% voiceover accessibility, Huboodle sets the standard for social gaming. Advance your level by playing any one of the five games and then share (or taunt) your results with friends using the in game chat! 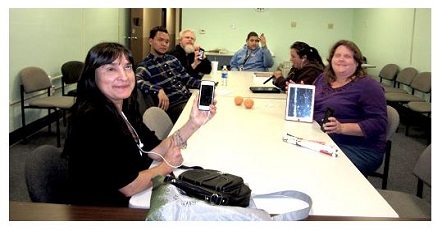 We have an Apple Devices Club that meets on the third Friday of every month. It's free to our Blind patrons and don't forget to bring your iPad, iPod, or your iPhone. We meet from 1:00 p.m. to 3:00 p.m. on every third Friday. If you have an iOS app suggestion, feel free to email Feliciano Godoy at: fgodoy@blindnesssupport.com with the name and link to the app.